Actor and playwright Sudhanva Deshpande on his years with Jan Natya Manch and a martyred cultural icon. But in street theatre, as indeed in life, there is no empty space. The actor knows immediately, feels it in the gut, that this is a contested space. There is a claim being laid to the space by a people who are denied space virtually everywhere else. 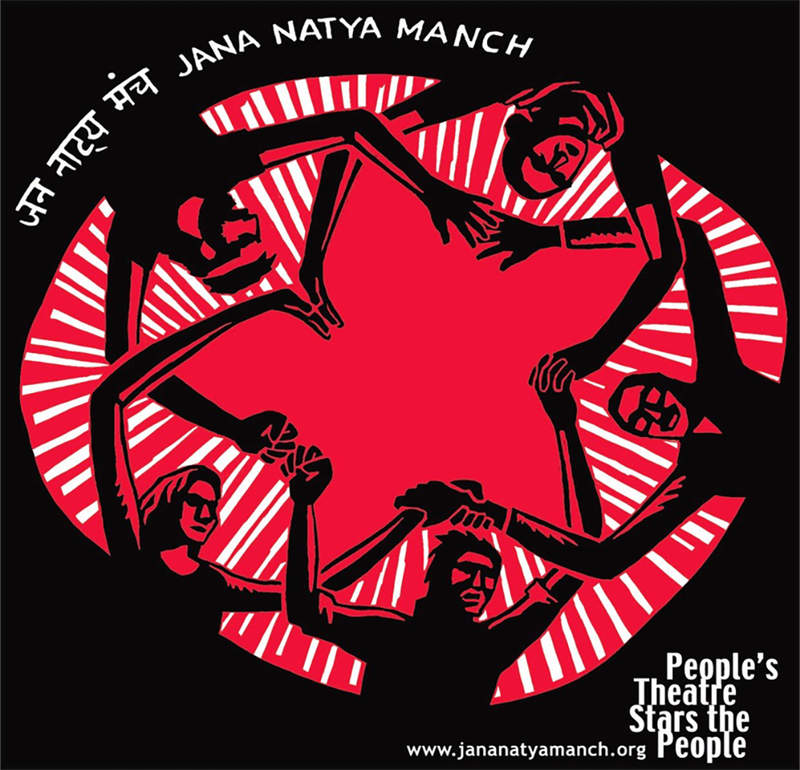 Jana Natya Manch (popularly known as Janam) is perhaps India’s best known street theatre group. 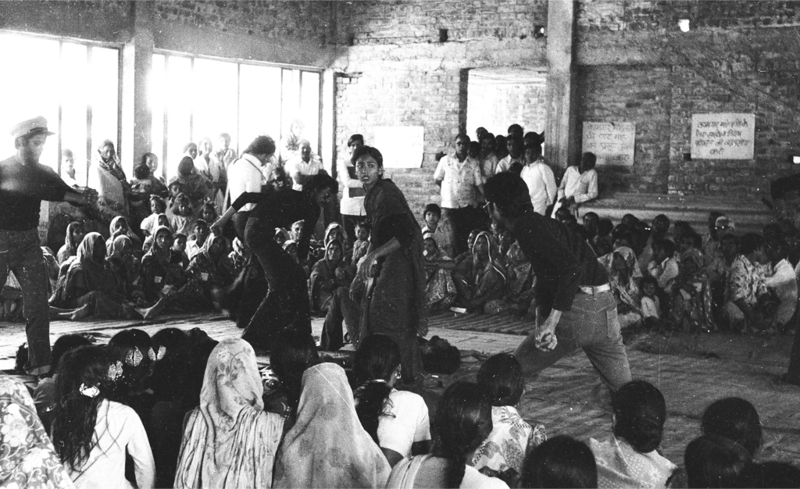 Founded in 1973 by a group of youngsters that included the late Safdar Hashmi, Janam has performed over 8,000 shows at nearly 100 streets and prosceniums. I first acted in a Janam play in the summer of 1987, when I was an undergraduate student at Ramjas College in Delhi University. Some DU colleges in the mid and late 1980s, including Miranda House and Deshbandhu College, had become a stronghold of the Students Federation of India, and ideas of the left were very much in the air. I have no pictures of that time. This is one of my earliest pictures in Janam. 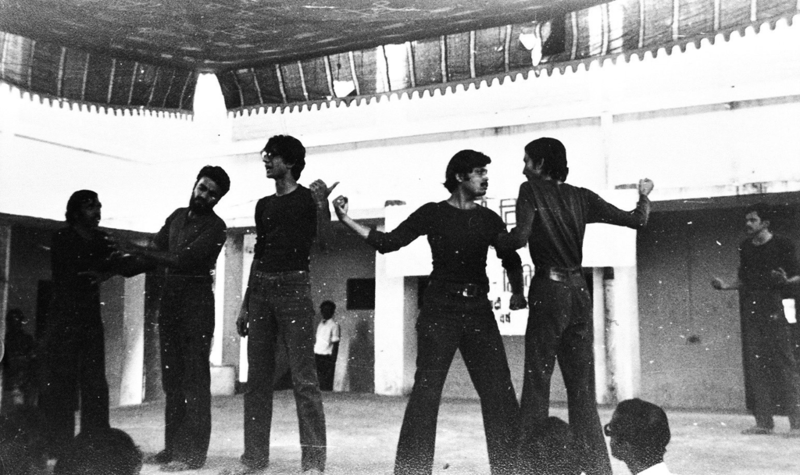 This is in 1988, and we’re performing Raja Ka Baja at Deshbandhu College. 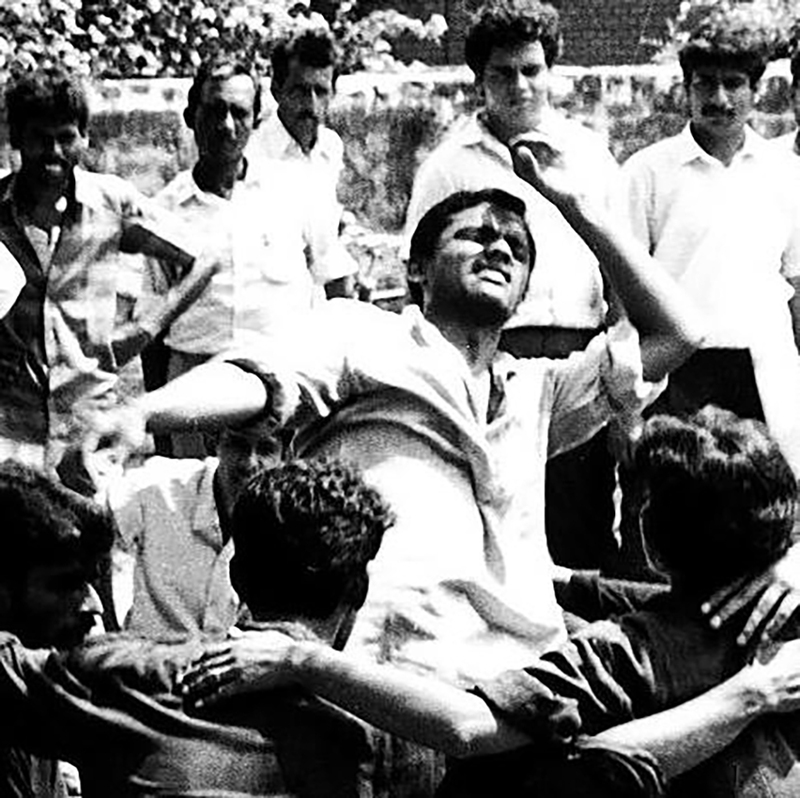 That thin fellow with black hair in the centre is me, playing Rameshwar Dayal, an unemployed youth. Encircling me are, from left, Brijender Singh, Sanjay and Shikha Sethi. This picture was taken by Safdar Hashmi. 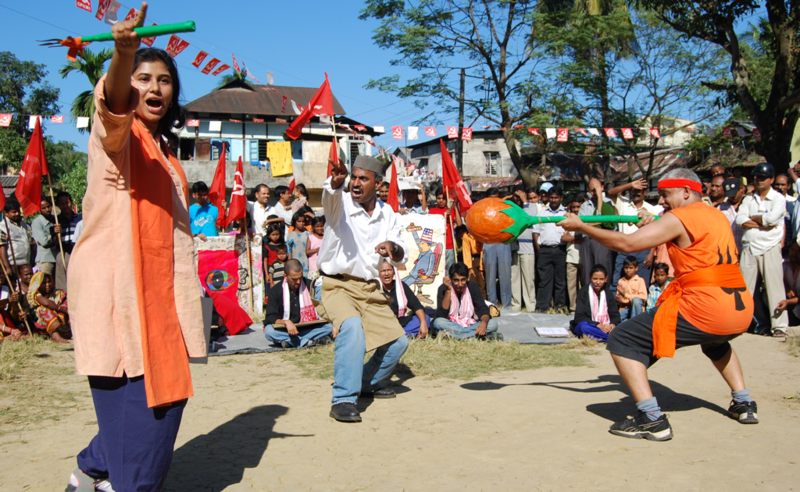 The Janam play I acted in was called Samrath Ko Nahi Dosh Gosain, on inflation and the public distribution system. Safdar Hashmi had seen me act in college and called one day to say that Janam was desperately looking for someone to play a small role in their production. I agreed, not realising that my role would involve singing. Later, when I told him that I couldn’t sing, he thought I was being modest – that is, until he heard me. He took me to Kajal Ghosh, the music director, to find my scale on the harmonium. As soon as Ghosh announced triumphantly that my scale had been found and pinned down, the damn thing would escape. I had no idea what the two of them were talking about. 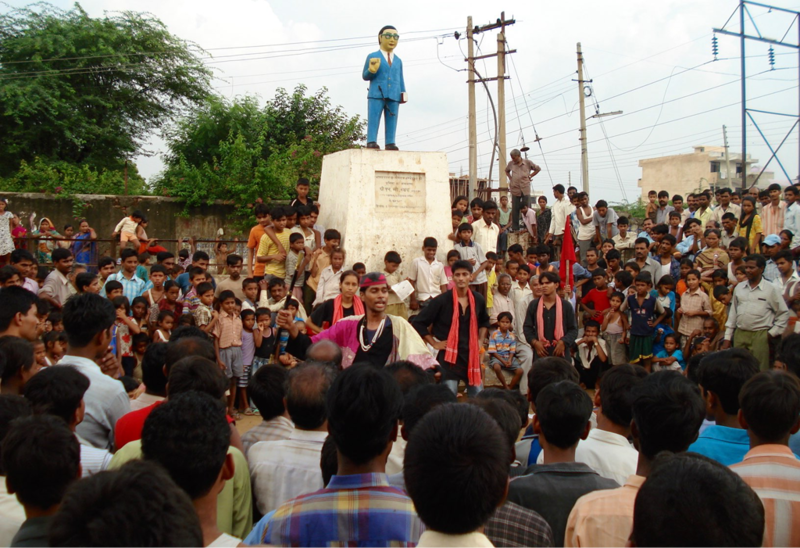 An image from Satyashodhak, a play on the life and times of Jyotirao Phule. It seems strange to say this now, but back then, Phule was virtually unknown in North India, the BSP still a fringe party, and Dalit Studies was at least two decades away from being an academic discipline. Safdar was a lovely singer, so he couldn’t figure out why I found that simple thing – sticking to scale – so hard. My career as singing star died a premature death. My friend Sanjay Maharishi also acted in the same play: he could sing, but wasn’t available on all the dates required. So the singer ended up doing a few shows in a non-singing role, while the non-singer did all the shows in a singing role. Cumulatively, we were a bit of a disaster, though Safdar, bless him, assured us otherwise. After five years of doing large stage plays in the open, often for an audience of thousands, Janam had reached a bit of a dead end. The Emergency was over, but the organisations which hosted our shows – mainly the Kisan Sabha and trade unions – had become impoverished, as a result of having to work underground during the period. This is how Janam’s famous play, Machine, was born. It was written jointly by Safdar Hashmi and Rakesh Saxena, inspired by a worker struggle at a factory in Ghaziabad, called Herig India, where six workers were shot dead for asking for a small parking lot for their bicycles and a tiny bhatti, or oven, to heat their food. The play was barely 13 minutes long. It was poetic, funny, moving, and inspiring. The idea of performing in a circle, with the audience all around us, emerged naturally while Machine was being made. Without quite knowing it was called that, Safdar and his comrades had “invented” street theatre. Of course they hadn’t really invented it – street theatre had an older history, one which they were not aware of and, remarkably, at the very moment that Janam was creating Machine, Samudaya, a theatre group in Karnataka, was also creating a play called Belchi, using very similar techniques and form. It was nearly three years before the groups realised they were both doing the same thing at the same time. 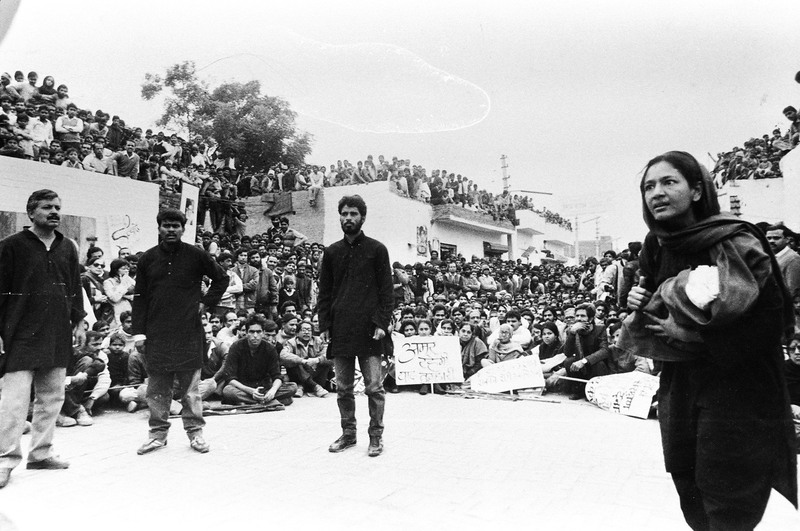 Street theatre, in its modern Indian avatar, was born in reaction to the Emergency, as a form of resistance to authoritarianism. Today, as we see an unprecedented authoritarianism in our polity, street theatre acquires added edge, because it helps us forge, protect, nurture and push the idea of democracy not as a once-in-five-year ritual of voting, but as practice on the streets. Moloyashree Hashmi, Safdar’s partner, was the only female actor in the group at the time. Safdar found a poem by a revolutionary Iranian schoolteacher Marzieh Oskoui, called I am a Woman, and the play Aurat began with a rendition of that. Moloyashree played three women: a child wanting to go to school, a college student and professional and, finally, an old factory worker with six (male) actors essaying a variety of other parts. Playwright Habib Tanvir loved Aurat, calling it a “poetic abstraction realistically encapsulating sharply etched out vignettes of a woman’s life”. Like Machine, Aurat was also jointly written by Safdar and Rakesh. It was translated and performed in several languages all over India and in Pakistan, Nepal and Bangladesh. Along with plays like Jyoti Mhapsekar’s Mulgi Zhali Ho (Marathi) and Theatre Union’s Om Swaha (Hindi), Aurat gave voice to the feminist upsurge of the late 1970s and early 1980s. Moloyashree performed this play about 2,000 times and I performed with her at least 500 of those times. It remains, to my mind, the finest piece of acting I have seen in street theatre. Her performance was tender, vulnerable, moving, poetic, powerful, all at the same time. I know that for thousands of young women, just watching such a powerful performance in the open, in a public space, was inspiring and empowering. Two decades after 'Aurat', we made another play on patriarchy. We were determined to make it as different from 'Aurat' as possible: if 'Aurat' was episodic and tried to capture the experience of everywoman, this was going to be a play about very specific characters, rooted in a particular milieu. If 'Aurat' had taken up the most visible aspects of gender discrimination, this was to be about those invisible aspects that we rarely even talk about. I proposed a triptych of stories. In the first, the daughter of a domestic servant (played superbly by Nirmala, pictured above) is gifted red ribbons, but is prevented from playing with them. In the second, a middle-aged woman from a conservative middle class family (Moloyashree in her element) protests against her daughter’s proposed marriage to a “successful” boy because he is accused of corruption. In the third, a woman worker (again Moloyashree) disrupts the unity of the union in her factory by demanding a separate toilet for women. This remains one of Janam’s best street plays. On the fourth of January 1989, Jan Natya Manch delivered the single most important street theatre performance in the history of India. The troupe had been attacked on the morning of Sunday, January 1, while performing in a labour colony at Jhandapur in Sahibabad. Minutes after Janam began their play, goons from the Indian National Congress arrived, and demanded to be allowed to pass through the performance area. Safdar asked them to wait or take another route. The goons assaulted the troupe and the audience with iron rods and firearms. 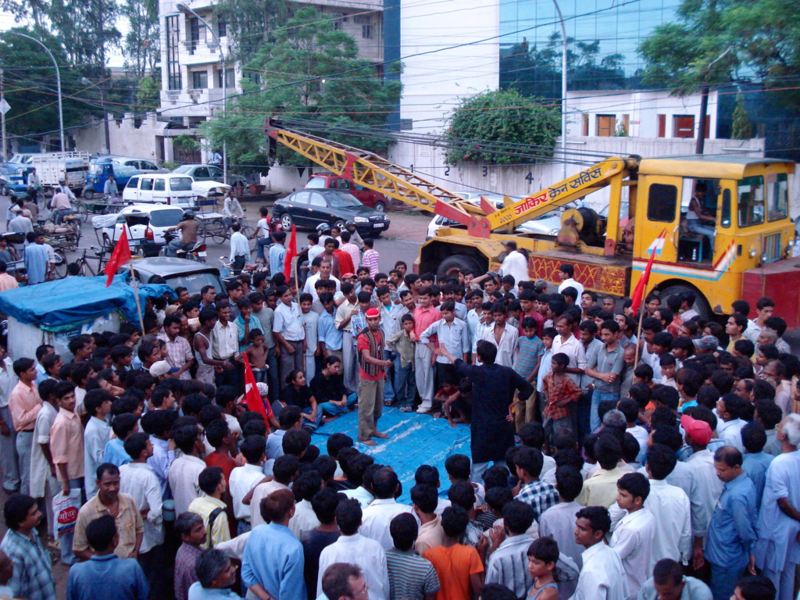 A Nepali migrant worker who was a resident of the area, Ram Bahadur, was killed on the spot. Safdar was grievously injured. We took Safdar to a hospital in Ghaziabad, and then transported him to Delhi. The news of the attack had gone viral, before we knew what that word meant, in those pre-mobile and pre-internet days. Hundreds of people came to Ram Manohar Lohia Hospital to stand vigil as it became clear that Safdar was not going to survive. He finally succumbed to his injuries on the night of January 2. He was cremated the next day and his funeral procession was accompanied by 15,000 people. In this picture are (left to right) Subhash Tyagi, Jogi, Brijender and Moloyashree. The actor she is speaking to, who is not in the frame, is me. Vishwajeet Pradhan, who played the cop, is sitting between Jogi and Brijender. Thousands of people turned up for the show – local workers, of course, but also about a dozen bus-full of people from Delhi. Less than 48 hours after his death, Janam, led by Moloyashree, returned to the spot and completed the performance. It was a stirring act of courage, commitment and defiance. I acted in the performance, and the memory of that morning still gives me goosebumps. Then and now, Janam frequently tackles current political issues, because we believe that if your theatre does not take cognisance of the histories of contestation around class, caste, gender, language, region, if your theatre does not take off its fancy clothes and wade into the slush, if your theatre does not stand in partisanship of the poor and the oppressed, your theatre has no meaning. I remember clearly the day the Godhra train burning took place: We had met for rehearsal in the evening, and we knew, in our gut, that this was something Hindutva forces would capitalise on, but on that evening, we had no idea how horrific it was going to all turn out to be. Within days of Godhra, we had started improvising in rehearsal to prepare a play. It was not easy. So far, all our plays on communalism had put all fundamentalists on an equal footing, and had ended with the correct, but inadequate, call for people to live in peace with each other. But Gujarat 2002 was more than just communalism – it was a step by Hindu Right to refashion the secular republic as a majoritarian, autocratic, Hindu Rashtra. We had to find a way of saying this dramatically in a play that was to be played in the open, even as the pogrom in Gujarat continued. Eventually, the play used three registers of speech. It opened in complete silence, with actors holding up placards with text and images that conveyed the horror of what was happening. The audience was invited to bear silent witness. As the violence had unfolded in real time, a number of poets had written powerful lines about it. We ended up using three of these poems, by Vimal Kumar, Manglesh Dabral and Vishnu Nagar. These poems gave voice to the rage that we collectively felt. Guru Golgangol played by Ashok Tiwari (centre), and his two side-kicks: Buddhibali (the brainy one, played here by Joyoti Roy, left) and Baahubali (the brawny one, played here by me, right). The third register was the satirical. At the end of this play, even though people would argue with us about the usual things – calling us Hindu-haters, accusing us of ignoring the Kashmiri Pandits, claiming we gave clean chits to the Muslims – we were never physically attacked. Some part of it, perhaps, had to do with humour: the satire was so funny that it blunted some of the anger. But maybe it also has to do with plain luck. Who knows, if that luck would hold if we were to do something similar today, for instance, a street performance about the gau rakshaks.